A white outfit always makes a classy statement and one can never go wrong with it. Whether, it is summer, spring, autumn or winter – you will never make a fashion faux pas if you choose to sport an all white ensemble. However, we feel that all white attire can be made more interesting by pairing it up with one statement accessory – a jazzy vibrant clutch! A vibrant clutch in bright shades like pink, purple, yellow, blue, red can work wonders on an all white base, besides making a snazzy style statement. In fact, many celebrities this year have been seen sporting this trend – and for the right reasons. So, let us take a look at some of the chicas who have been smartly rocking this combination, and get some style inspiration from their personal takes. Abigail Klein was seen carrying a vibrant lemon yellow clutch that provided a brilliant contrast to her white short halter dress, at the premiere of the movie That’s My Boy in Los Angeles. Similarly, Georgia May Foote created a va-va-voom effect when she showed up for the TRIC Awards 2012, at the Grosvenor House Hotel London, in a ravishing combo of a white short crochet-lace dress and a bright red envelope clutch. Bridget Moynahan sure turned many heads with her appearance at the screening and panel discussion of CBS’s Blue Bloods in North Hollywood. 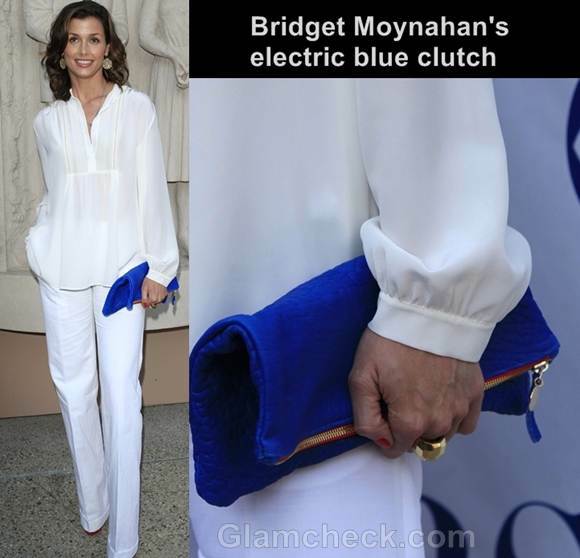 She paired a pristine white outfit, comprising of a white full sleeved tunic top and white pants, with an electric blue envelope clutch. In fact, it was the vibrant hued clutch that single handedly pulled up an otherwise plain ensemble – because if you take away the clutch, the outfit in itself loses points and the style-o-meter goes down. So, you can see how one vibrant clutch, when paired with a solid colored base, can turn around an entire look. This was also how LeAnn Rimes rocked at the Grand Opening Celebrity VIP Reception of the First Signature La Fitness Club in California. She paired a white top-white pants attire with a funky yellow envelope clutch. 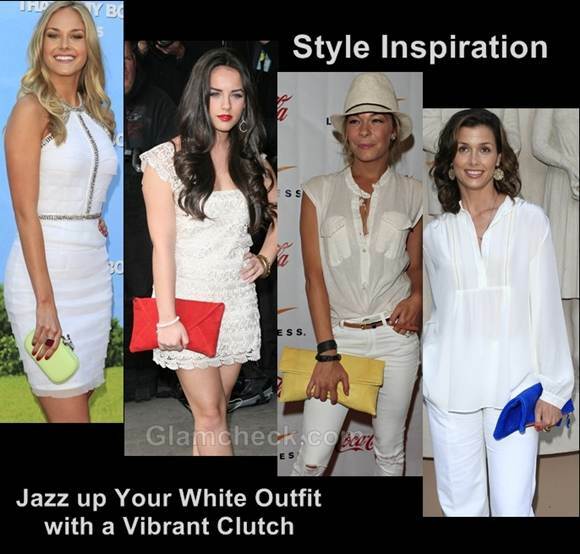 So, we can see how a vibrant clutch can totally jazz up a white attire – whether it is white short dresses or a white top-white pants combo. In fact, the following are some more tips on how to bring out the best of this combo. Try not to match the color of your clutch with your footwear. Though, matching them is usually a safe style bet, but here we do not want to divert away the focus from the clutch, so wear stilettos/pumps/sandals in a more subdued shade to avoid clash. Now go ahead, and play around with your white separates to make an all white outfit so that you can sport this look. Of course, don’t forget the vibrant clutch!